File this under the "cool stuff to impress your date with" label, but Google is giving you the chance to do handwritten searches on your iOS or Android smartphone or tablet, instead of using the on-screen keyboard. We kid, we can actually imagine quite a few scenarios where this will be useful, and they don't only involve bowling accidents and swollen fingers, although Google does try to imply that the guy with the crutches in the promo video thinks this is a godsend for him. 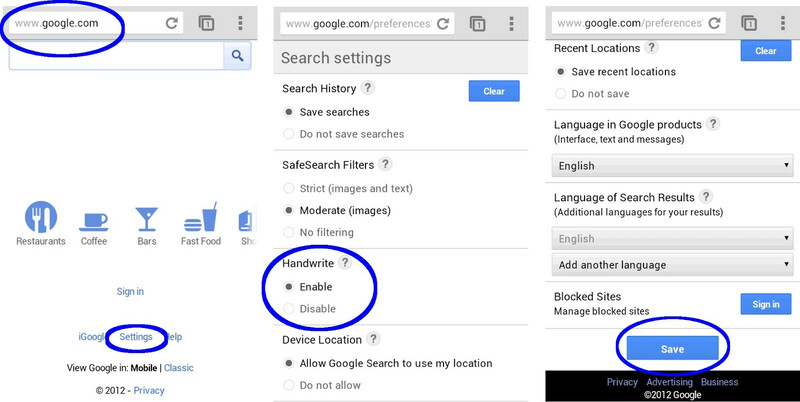 To enable the feature, you have to go to Google.com with your mobile browser, find the "Settings" link at the bottom, then look for the "Handwrite" option, which is third from the top, and checkmark "enable", since by default the option is disabled. Don't forget to scroll all the way down and save, since it doesn't do it automatically when you hit the Back button. There you have it, you can now scribble the word with your finger directly on the phone or tablet screen, and it will appear in the search box, autocomplete and all. A handy editing bar appears at the bottom when you handwrite, allowing you to insert a space, delete letters, or turn off/on the handwriting functions with the touch of a button. You can do it in 27 different languages, so we can imagine this Handwrite feature being very useful for people in China, Japan or Korea, for example, but Handwrite will only recognize letters in the preferred language you have in your search settings. Letter recognition is very fast and accurate, pretty close with the best apps we've used, even with our ugly handwriting. It can actually save some time for quick searches, as you only need to scribble two or three letters and autocomplete does the rest, whereas you have to tap on the search box to evoke the on-screen keyboard, and then start writing. Now you can type, speak, or handwrite your Google searches, which will also come in handy if you have a device with smaller screen and cramped keyboard. Cool, eh? It's cool but like you said, it does take longer to write than to type. Good to have plenty of options. Good Job Google. stuff like this makes me wonder even more why Apple and Google can't just get along. Both are great companies that bring alot to the table, no reason to waste all this money in court. I feel like this is wasted on most smartphones: writing with your finger is awkward and slow. Anything with a stylus though could really use this, such as the Galaxy Note, or any tablet really. I'm not trying to bash your article or anything, but the Korean language uses an alphabet system. It actually has fewer letters than English. How do I know this? I'm Korean. So Koreans have ease writing with a keyboard just like typing English on a keyboard. However, Chinese you are write there's almost a different character for every word which this will be useful.Not sure about Japanese though.. I mean right instead of write. Hmm, didn't find the option to enable it on my HTC Trophy. Wanted to mess with it a bit, but whatever.